across the Vallecitos River Valley. Thunder Mountain (13,108) is the good looking rock to the left. The steep shoulders of Grizzly Peak are closer to us on the right. 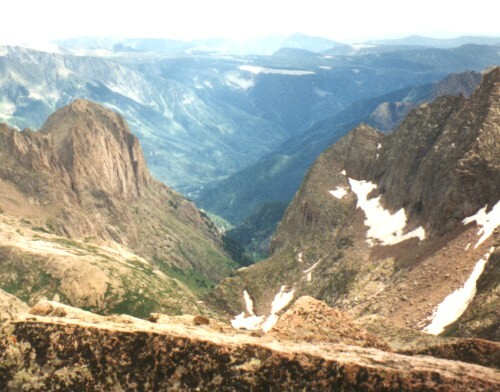 The grey rocks climbing out of the frame on the upper left are the slopes of Irving Peak (13,218). The highest point (right of center) which disappears into bright haze is Graham Peak (12,531). Moving right, is Table Mountain (11,705), treeless on top, followed by Granite Peak (12,147) and Slide Mountain (11,114).